On 29 March, WWF Thailand and the Bangkok Metropolitan Administration (BMA) join more than 400 cities and towns across the globe in WWF’s Earth Hour Climate Change Campaign in which participants in Earth Hour show their committment to conservation. From 8 pm to 9 pm, they pledged to turn off lights and non-necessary electrical appliances to save energy and reduce carbon emissions. 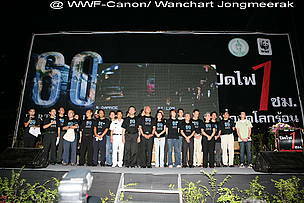 On 29 March, WWF Thailand and the Bangkok Metropolitan Administration (BMA) joined more than 400 cities and towns across the globe in WWF’s Earth Hour Climate Change Campaign in which participants in Earth Hour showed their commitment to conservation. From 8 pm to 9 pm, they pledged to turn off lights and non-necessary electrical appliances to save energy and reduce carbon emissions. Major cities involved in the campaign include: Atlanta, Bangkok, San Francisco, Phoenix, Ottawa, Vancouver, Montreal, Dublin, Sydney, Perth, Melbourne, Canberra, Brisbane, Adelaide, Copenhagen, Aarhus, Aalborg, Odense, Manila, Suva, Lautoka, Chicago, Tel Aviv, Toronto and Christchurch. Climate change is the most significant threat to life on earth, with some of the world’s most recognizable natural wonders like the Great Barrier Reef, Antarctica, and the Amazon rainforest threatened by rising temperatures and changing weather patterns. In Thailand, WWF and BMA began Earth Hour preparation by inviting representatives from 41 governmental and private organizations to a preparatory meeting on 15 Feb. The participants unanimously agreed to support the Earth Hour Campaign’s efforts against global warming by turning off electricity in their headquarters and business outlets for one hour. Strong support for the campaign has been assumed by Carrefour, a retail department store, in accordance with their corporate policies on environment. They have gone beyond simply turning out lights in their stores, and sponsored major parts of the awareness campaign surrounding Earth Hour. With Carrefour’s support, WWF and BMA distributed posters and sticker to hotels, banks, department stores, public transportation outlets, schools, and hospitals. A public service advertising campaign was also aired on commercial TV channels, on closed circuit TV in buildings, and on the Ramkhamhaeng University TV education programme. Celebrities from RS, AF,TV 3, TV 7 also joined the campaign. Many switched their work schedules to join parades on Silom, Yowaraj, Khao Sarn, and Sukhumvit Roads in an effort to alert the greater Bangkok community about Earth Hour and the global warming crisis. 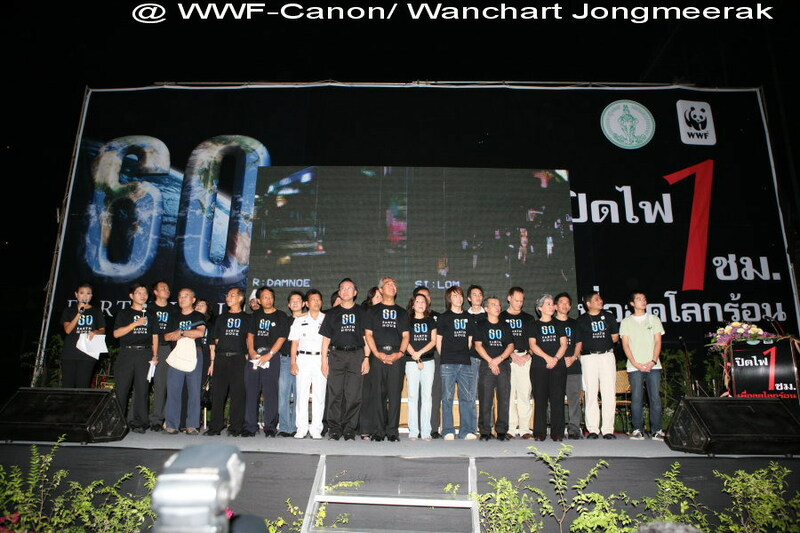 In the night of 29 March, WWF and the BMA organized a special roundtable discussion from 7-9 pm in front of the Central World Plaza. The event aimed to raise awareness on global warming with input from climate specialists, government officials, and the private sector. From 8 to 9 pm, BMA reported the situation on the switch-off along the six main roads in Bangkok: Silom, Yowaraj, Khao Sarn, Sukhumvit, Phetchaburi, and Ratchadapisak. 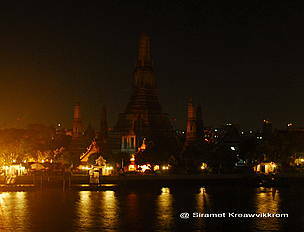 Three of Bangkok’s prominent landmarks also were doused including Phra Prang (Stupa) of Wat Arun, The Rama 8 Cable Bridge, and Rajadamnoen Avenue. Metropolitan Electricity Authority (MEA) helped calculate the energy savings during the hour when lights were off. The result of Earth Hour: Bangkok saved 73.34 megawatts of electricity in one hour for switch-off, which would have produced 45.8 tonnes of carbon dioxide. WWF Australia first initiated the Earth Hour Campaign in Sydney in 2007. When it happened, 2.2 million Sydney residents and 2,000 businesses took a giant step towards reducing the city’s greenhouse gas pollution by turning off lights and appliances for one hour. This massive collective effort reduced Sydney's energy consumption by 10.2% over the hour, which is the equivalent effect of taking 48,000 cars off the road for a year.